We aren't quite to the point where I am comfortable with making an easily contradicted statement along the lines of "Finally, this long winter is over!" but we must be getting close. At least it's not snowing, and every now and then we get some "good enough" flying weather. Yesterday was a good example: not warm enough for shorts and T-shirts, but the parka and mittens stayed in the coat closet. The air was calm, but in the sense of humid August afternoon five days into a stagnant high pressure area. The forecast promised benign air, but only seven miles visibility. That sounds like a lot when you're sitting on the ground, but it's not much to look at in the air. It was the kind of forecast that would elicit a disinterested "Meh..." in the more clement months, but a "Kumbaya!" when emerging from a dismal winter. Calm air. Perfect for practicing takeoffs and landings, but even more perfect for teaching someone else to do them. I had always been tempted to teach co-pilot Rick how to takeoff and land in the RV-6, but teaching a nose wheel pilot to land a tail wheel airplane always seemed like a bit too much risk. The RV-12 is significantly different in that area: it is very simple to land. I had Rick taxi around the hangars for three laps to get a feel for the swiveling nose wheel, which is very, very different from the steerable nose wheels he was used to. Without (well, even with) my years of tail wheel experience, it would have been much harder for me to adapt to it also. I figured getting a feel for it on the taxiways was safer than trying to figure it out during a takeoff roll. By the time we got to the end of runway 22, I was reasonably sure that he would be able to keep it pointed down the runway, although I strongly that Rick would go through the same over-braking learning curve that I did. That proved true, but by his fourth takeoff he was much lighter on the brakes. He got the feel for the landings even faster. It really is a friendly little airplane. That said, it is somewhat counter-intuitive that the landings are easier than the takeoffs, but it's true. Early on in the takeoff roll, you have to steer using the brakes and it is very difficult to get comfortable with that. You're urging the plane to get up to the speed where the nose will lift and there will be sufficient air across the rudder to make it effective for steering. It feels detrimental to the process to be using the brakes at the best of times, but even more so when you're still trying to get a feel for how much is just enough. When landing, braking feels much more natural - you're trying to get the plane slowed down anyway, right? Of course you're using the brakes! The only issue he had with the landings was that it felt to be like he was flaring too high. Keep in mind, though, that I was as nervous as a caged canary in an Ecuadorian coal mine - it's not easy giving up that level of control for the first time. I needn't have worried - they all turned out fine. After transitioning Rick from co-pilot to Captain status, we went up to Urbana for breakfast. Being a Saturday, the B-17 restoration place was open and we stopped in for a visit. One of the neatest things about the place is the willingness of the guys working there to stop what they're doing and tour you around a little. 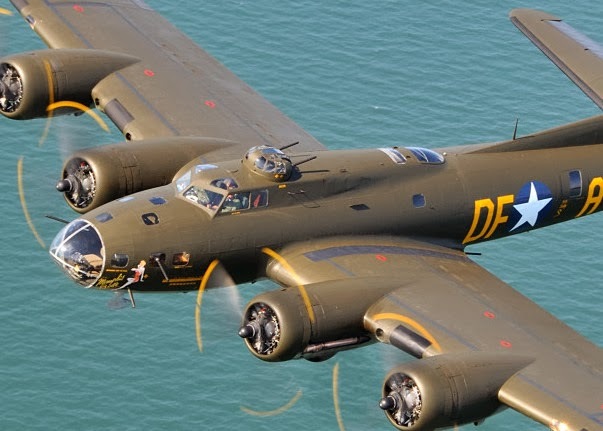 I enjoyed a fifteen minute chat with the guy that flies their B-25 - it's always interesting to talk to a pilot about an airplane that drinks oil by the gallon and has fuel burns measuring in at 100-plus gallons per hour. It's also interesting to talk to the restorers. Having built an airplane provides an entirely new perspective for looking at what they have accomplished. Four years ago, I would have looked at the hook-shaped oil tank oil tank straps and naively shrugged them off as just a simple part. Now I look at T-shaped aluminum bent into a fairly tight radius with the stem of the 'T' on the outside of the bend and think, "How in the world did they do that?" This naturally prompted me to ask, "How in the world did they do that??" The answer was, "Very slowly," just in case you're wondering too. Another part that was very difficult for them to fabricate was the oil cooler scoop mount at the bottoms of the engine nacelles. It's the unpainted part that looks like a door in the picture below. They made it by routing a channel into a large flat piece of wood, then bending a steel hoop that matches the outline of the recessed area around the circumference of the part. The routed wood was the female part of the mold and the bent steel rod was the male. They used a press to for the steel hoop into the mold, thus creating the trough around the edge. Me? I unpacked kits and riveted stuff together. Not the same thing at all! They've got quite a bit done up in the nose of the plane where the bombardier sat. The wooden box holds the belts of .50 caliber ammo for the nose gun(s). The panel on the wall controls the oxygen required for flying over 14,500' in an unpressurized airplane. They even have a Norden bomb sight. There was a day when I would have been executed as a spy for taking pictures of it. 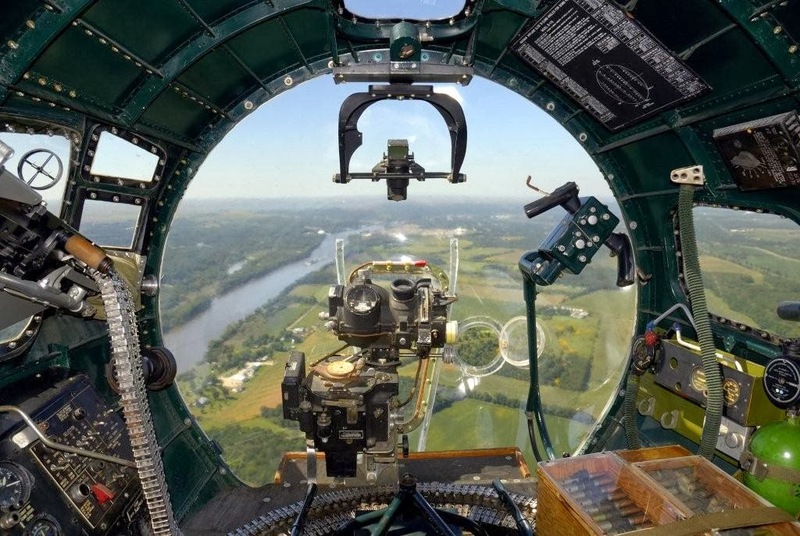 The Norden bombsight was a tachometric bombsight used by the United States Army Air Forces (USAAF) and the United States Navy during World War II, and the United States Air Force in the Korean and the Vietnam Wars to aid the crew of bomber aircraft in dropping bombs accurately. Key to the operation of the Norden were two features; an analog computer that constantly calculated the bomb's trajectory based on current flight conditions, and a linkage to the bomber's autopilot that let it react quickly and accurately to changes in the wind or other effects. Together, these features allowed for unprecedented accuracy in day bombing from high altitudes; in testing the Norden demonstrated a circular error probable (CEP) of 23 metres (75 ft), an astonishing performance for the era. This accuracy allowed direct attacks on ships, factories, and other point targets. Both the Navy and the AAF saw this as a means to achieve war aims through high-altitude bombing, without resorting to area bombing, as proposed by European forces. To achieve these aims, the Norden was granted the utmost secrecy well into the war, and was part of a then-unprecedented production effort on the same scale as the Manhattan Project. Since the Norden was considered a critical wartime instrument, bombardiers were required to take an oath during their training stating that they would defend its secret with their own life if necessary. 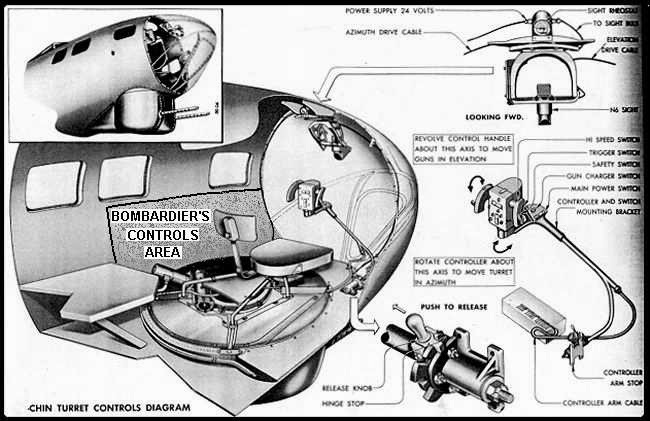 In case the bomber plane should make an emergency landing on enemy territory, the bombardier would have to shoot the important parts of the Norden with a gun to disable it. As this method still would leave a nearly intact apparatus to the enemy, a thermite grenade was installed; the heat of the chemical reaction would melt the Norden into a lump of metal. The Douglas TBD Devastator torpedo bomber was originally equipped with flotation bags in the wings to aid the aircrew's escape after ditching, but they were removed once the Pacific War began; this ensured that the aircraft would sink, taking the Norden with it. After each completed mission, bomber crews left the aircraft with a bag which they deposited in a safe. This secure facility was typically in one of the base's Nissen hut support buildings. The Bombsight Shop was manned by enlisted men who were members of a Supply Depot Service Group ("Sub Depot") attached to each USAAF bombardment group. These shops not only guarded the bombsights but performed critical maintenance on the Norden and related control equipment. This was probably the most technically skilled ground-echelon job, and certainly the most secret, of all the work performed by Sub Depot personnel. The non-commissioned officer in charge and his staff had to have a high aptitude for understanding and working with mechanical devices. Note that historians, who pride themselves on their 20/10 hindsight and concomitant vastly superior morals, may have a differing view of both the historical impact and morality of its use. I'll leave it to you to decide. Me? I just have a thing for mechanical gadgets - I think they're wicked cool. This is what it will look like when it's done. Note the flight yoke looking like thing standing on a post to the right of the bomb site. That is the control for moving and aiming the chin turret. The inverted U hanging down above the bomb sight must have been an aiming sight for the chin turret. It seems like that bombardier could have been a very busy fellow at times. A lot of the parts that the team finds for the restoration come from odd places. There was something (I forget what it was) that they found under an old widow's porch. The throttle stand was found in a bar. And again using my preternatural ability to peer into the future, here is what it will look like installed. 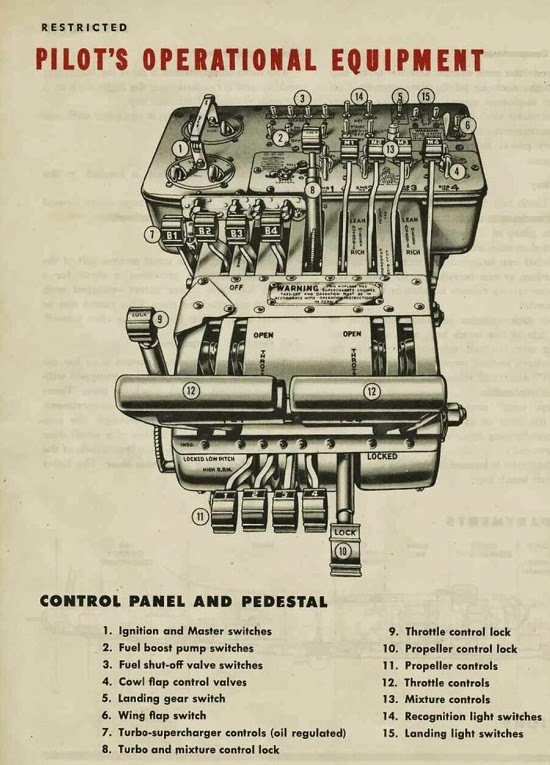 Looking at this has prompted me into trying to find out why there are six throttle handles to manage four engines. My working theory is that the two handles on the top of the six pack control the #1 and #4 engines, or in other words, the furthest out on the left wing (#1) and the furthest out on the right wing (#4) independently of the other two. You would do this if you wanted to use differential thrust to assist in getting the big bird to turn while taxiing on the ground. The middle two handles (they look like there are four - they are split down through the 'cylinder') would be used to control all four engines at the same time. The bottom two would control the inboard engines. Some (most, actually) things they build up from plans. 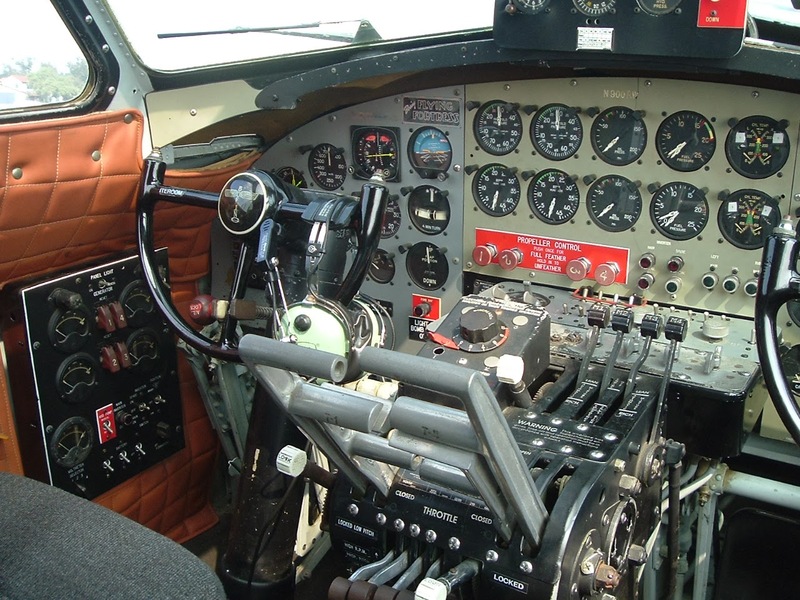 Something like 99% of this control surface is newly built, but they found the original torque tube - fabricated a new one would have cost tens of thousands of dollars, and it's a barely noticeable part. It's the little things that matter the most, it seems. This is a mold being built to form a new piece for the turtle deck that streamlines air behind the cockpit and dorsal turret. They even restore the machine guns, although I strongly suspect that they will be inert. The vertical stab is almost entirely new build. They have reams of drawings and plans to work from. They even have (inter) bombs to carry in the bomb bay, someday. In less interesting news, there is a new RV-12 at my airport. One of the guys that would stop by now and then when I was building my plane has made the leap: he sold his Cessna 172 and bought a nearly complete RV-12. Pete and I are both excited about the prospect of helping him finish it up - it's right at the stage where it starts to sink in that this thing is going to fly in the near future. As luck would have it, he thinks my brown seat cushions (which I selected years before I know what color the plane would eventually be) will look better with his intended scheme than the cushions that came with his. And I thought his cushions would go better with my paint than the brown ones. As I transition to the new interior design, I'm either going to have to re-paint or (and more likely) buy the interior kit from Van's to get everything back in sync, but that's easy to do and there is no great urgency to do it. I'm probably going to have to re-do the panel too, but that is also something I've already been thinking about as a "some day" project. Wonderful!! this is really one of the most beneficial blogs I’ve ever browsed on this subject.After read this i get some idea about Airport Management Courses | Airport Courses in Chennai thank you for sharing this good info with us.